Phil: If a picture is worth a thousand words, is a graphic novel a better read than a normal book? While I might be as nerdy as they come, graphic novels always passed me by. I suppose it’s easy to group them in with the comics I used to read as a kid. Fun, but for a fast reader, even as a child, Buster or Whizzer and Chips didn’t hold me for very long. When we write, both of us picture the scenes in a series of images or as a piece of film. There are segments of our book that are very visual indeed with elements of slapstick or action movie going on. Would these translate to a series of drawings? 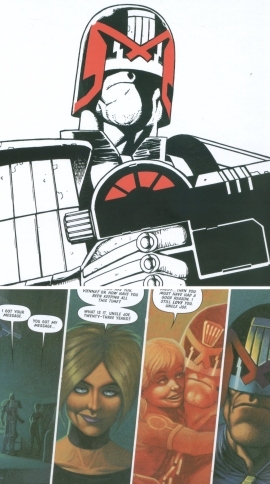 Out of curiosity, I spent a whole 99p on the first issue of a new partwork based on the Judge Dredd character from 2000AD. I know a bit about the main character, have seen both films, although the cognoscenti tell me the first one is a million miles from the comics, and am a bit curious. Book 1 is titled “America” which you might think refers to the country but is in fact the name of a female character, admittedly named after the USA but long after said country had ceased to exist in the way we know it. America represented a serious turn for Judge Dredd and the first 4 stories are found in this collection. All are complex and not a little disturbing in places. There are twists and turns along the way and you do find real character development. I was fascinated by the way the artwork moves things along. Many of the panels are narrow to pick up the pace of the story. They only provide glimpses of the action for the same reason. Unlike the sort of comic I was expecting, the size and detail within each picture varies enormously – there are a lot of subliminal messages being given before you study the picture itself. Stylewise, I was reminded of the sort of smokey, dirty world that Phillip Marloe lived in, even though this is over two centuries after he would have been around. Maybe, like with the detective novels, audiences like a vicarious view into the underbelly of society that they prefer to view from a safe distance. Reading the book took me longer than I expected. Not as long as pages full of text but a more than a couple of hours for the whole thing (sorry, no page numbers and it’s too late for counting). More to the point, I really enjoyed it. Not enough to buy the full series, which while it looks like an excellent deal would consume too much valuable shelf space, but at least I sort of get why people like this stuff. So, could Kate vs The Dirtboffins be a graphic novel? Possibly. We’d need a talented artist and then have to agree how every scene would look. Maybe this spoils the “pictures are best in your head” thing but they that won’t stop us when Hollywood comes a callin’ will it? Phil: As Candice wrote on Tuesday, we have gone to some efforts to make our characters realistic. They are then set lose in our imaginary world, which itself has some basis in reality. Although some of the ideas are preposterous, we’ve tried to root the story in the real world so that you can really imagine the things in the book, happening in real life. But is this the only way ? I’ve been reading a bit of Tom Sharpe, specifically the follow-up to Porterhouse Blue; Granchester Grind. We both love a bit of Sharpe and much of our style of humour owes a bit to his writings. I’d not read him for a while until I tripped over a second-hand copy of the book and couldn’t remember it at all. As I read, I realised I had been this way before but still enjoyed the journey. Like a road trip you make every day on the bus, each time to travel you notice different things. At first you concentrate on the route but eventually you take a good look at the scenery. As I read, I noticed something I didn’t the first time around – Tom Sharpe characters are unreal. It’s not just the names, although Edgar Hartang and Lord Jeremy Pimpole are two of the more sensible and pronouncable in the book, but that they simply don’t behave like real people in the real world. What they do do is behave like people in the world created by the author. This world is a cartoon version of the world we live in most of the time. Imaging everything turned up to 11 and you get the idea. Thinking about it, all of Mr Sharpe’s books are like this. By varying degrees, every single character and every single situation is a cartoon. A very funny cartoon but a cartoon none the less. It’s a litery equivalent of a Tom & Jerry film. Here, the mouse can hit the cat with a frying pan and watch his face change shape to match the pan. And then the chase continues. We know this doesn’t happen in real life but in “Tom’n’Jerry” world, all those pesky laws of physics are suspended and so you really can survive that plummet into the crevice. So, is all our effort to give characters back stories for nothing ? I don’t think so because the full-on Sharpe isn’t our style of writing, but it’s certainly interesting to realise that he has a style and examine it. As a writer, this is a bit like standing in the wings watching a magician at work to find out how the tricks are done. Great fun, but you should really go and watch the show from the cheap seats first to see the how it is meant to be enjoyed.